Star clusters such as the Pleiades are often considered some of the most beautiful objects in the sky. 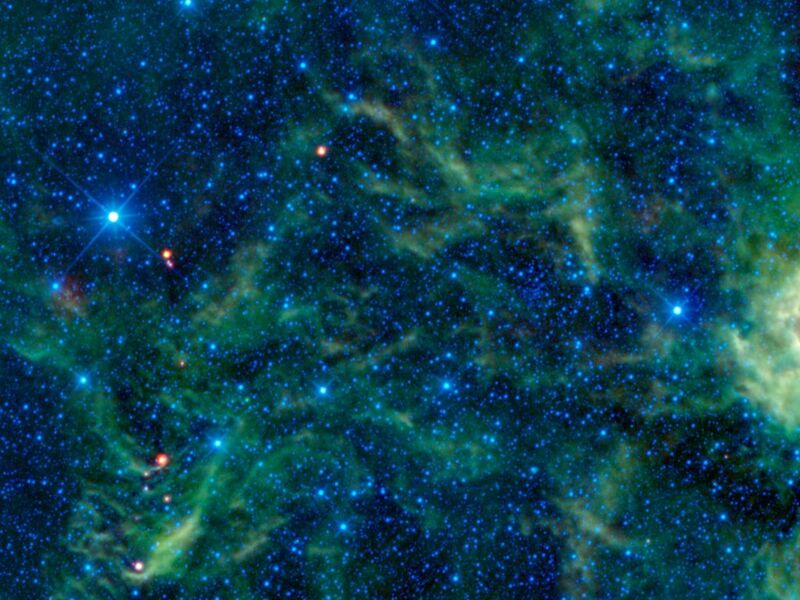 Yet in this image taken by NASA's Wide-field Infrared Survey Explorer, or WISE, the star cluster NGC 2259 is overshadowed by the surrounding stars and dust which glow brightly in infrared light. Star clusters are groups of stars held together by their own gravity. Larger star clusters, with hundreds of thousands or more stars, tend to form into spheres and are called globular clusters. Open star clusters with up to a few thousand stars are more irregularly shaped. NGC 2259 is an example of an open cluster where the stars are more loosely organized. As seen in visible light through a telescope, NGC 2259 appears as a smattering of stars loosely clustered in an irregular group. 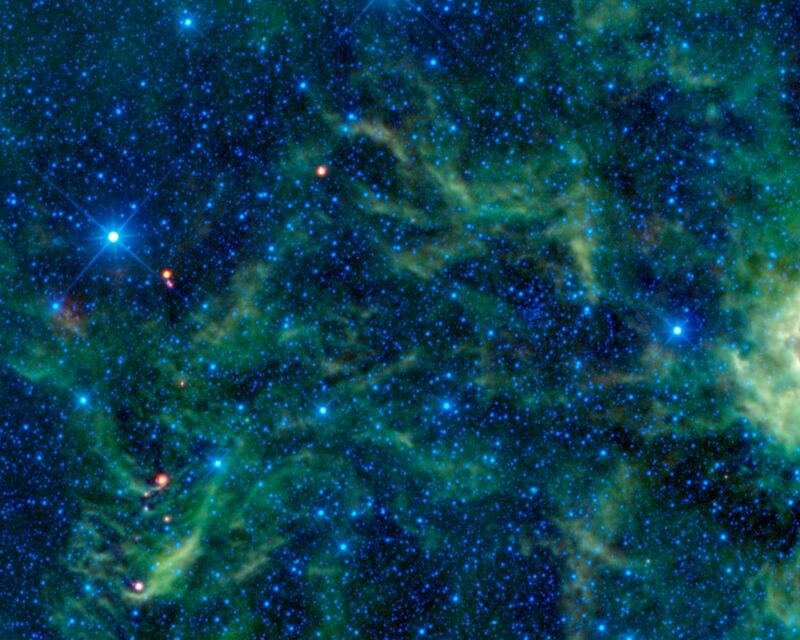 In the infrared light captured by WISE's detectors, nearby gas and dust clouds which are dark in visible light, along with stars whose visible light the clouds block, emerge into view. 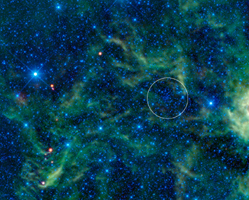 Seeing more stars as well as glowing gas and dust in the infrared makes the star cluster less obvious. In the annotated version of this image, NGC 2259 is located within the white circle. One of the more prominent objects in this image is the bright blue star seen on the left side. This star is HR 258. Although it appears to be one star, it is actually a binary, or double, star system. The two stars are also known as CCDM J00549+2337 A & B. At a distance of 127 light-years, this star system is much closer than the NGC 2259 star cluster, which is roughly 12,000 light-years from Earth. The NGC 2259 star cluster is hundreds of millions (300,000,000 to 700,000,000) years old. While this sounds old, it is much younger than the age of the sun, which is 5.5 billion (5,500,000,000) years old. However, NGC 2259 is much older than the red-colored young stellar objects seen in this image, which are typically only a few million years old. 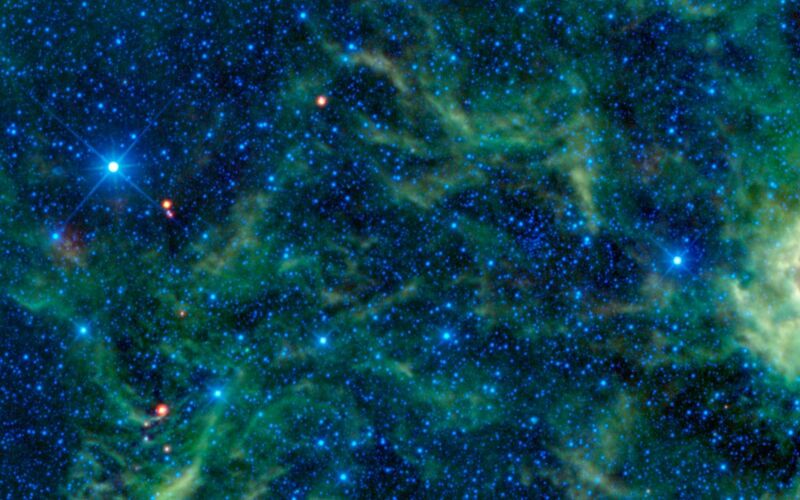 Seen scattered around the image, these young stars are forming within the clouds of gas and dust. The colors used in this image represent specific wavelengths of infrared light. Blue and cyan represent 3.4- and 4.6-micron light, mainly emitted by hot stars. Green and Red represent 12- and 22-micron wavelengths, primarily light emitted from warm dust.